I have 2 lines entering my terminus. One comes in from the left curve and the other from the right curve. Then the two lines become 3 in the station. The outer lines will be for the platforms and the centre road, hopefully, will be engine release or stock storage. I would like it so all 3 roads can leave by both incoming lines. Can this be done without a double slip please? PS I realise there will be some DPDT switches to wire up. A side note: the double slip is usually to be avoided, in fact in virtually all scales. Can you draw a sketch? Agreed that double slips cause possible derail issues and provide plenty of interest when being wired up but double slips were very popular on the real railways, especially in the UK. 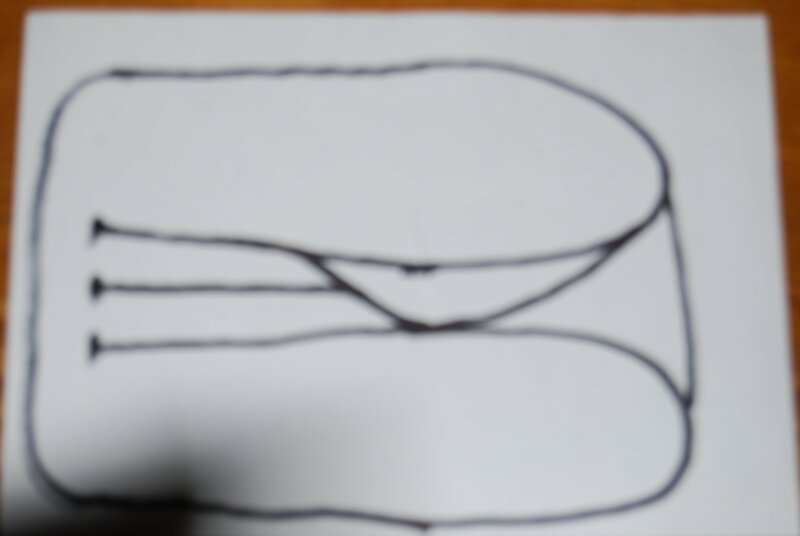 Sorry the sketch does not do me justice but hopefully you will understand the 2 lines into the 3 lines of the station. I have put in the track as I see it but other more experienced might have other ideas. I try to use only set pieces of LGB track lengths. A double slip is really only a couple of points, 'toe to toe'. Useful for places where the space is restricted. I have one to fit in my proposed layout, although it will mostly be used as a diamond crossing. I've heard that they can be problematic in G scale, but I just want one! Yes on reading the first post that came to mind. A wye and a 3 way point? I've managed to achieve what I wanted just using R1 points. It does take up quite an amount of space but still means I can run 3/4 coach trains. You won the pools, or something? You can save yourself two turnouts... cut out the link from the top 'platform road' to top leg of the 'triangle'. I say this, because as you will not be running two trains at the same time into the station, the link is redundant. Trains will still be able to enter the station platforms from either end of the oval. I think that Sarah wants to run from one side of the Station to the other without changing any points thus giving the feeling of going from somewhere to somewhere different. As for a Double Slip, one would work where you have used 2 Points and the LGB ones are very reliable and completely viable for you with your predominantly R1 Railway. But the geometry may be tricky to sort out without some short lengths of rail in as in your plan and LGB Double Slips are pretty expensive even if you can find one second hand. Probably + £100. We also found on the Ruschbahn that Short Stainz Type Locomotives were a little bit challenged with pickups due to the Dead Frogs. For you to justify Sarah, if consider the cost is worth the short saving of space for you. Due to the heat.. Having a jungle.. And possibly the cats and foxes?? I am in the unenviable position of being able to supply dead frogs.. I have considered removing the link and I might yet still. It has all that I planned; that is any train arriving at any station platform can be dispatched through either of the loops. Unfortunately it isn't quite as neat as I had hoped. 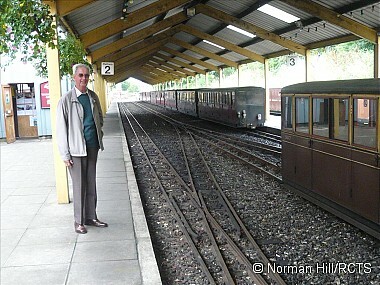 This is the station at Aylsham on the Bure Valley Railway. 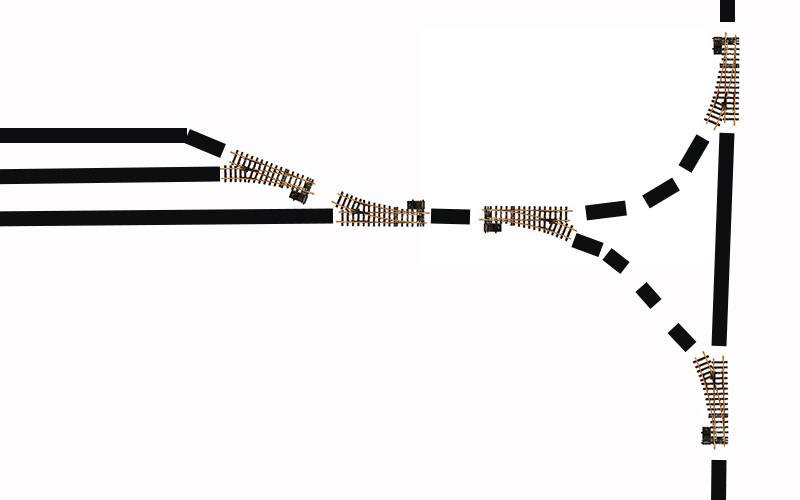 It has 2 platforms faces, with a shared run round loop. A 3 way point links the platform roads to the run round loop. Reactions: Sarah Winfield and Sean. Your diagram above has 7 turnouts, this one has 5. You dont technically need a wye switch to make it work..
Ah, that gives me exactly what I want. I was going to compromise but your suggestion meets my requirements. I'm DCC what about wiring please will it involve DPDT switches?